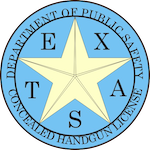 This is the class needed to obtain your license to carry a handgun (LTC) from the State of Texas, it will allow you to carry a handgun open or concealed. The State of Texas requires a minimum 4 hour class (not including range time) to obtain your Texas license to carry. The average total class time including classroom and range is about 6 hours but may vary depending on class size. 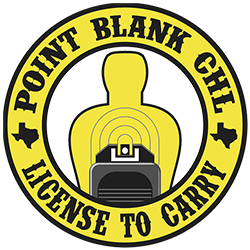 Point Blank CHL Firearms Academy is certified by the State of Texas to teach this State required course. The first step in getting your Texas license to carry is to take the class. The required material taught in class is on a very basic level and easy to understand. You now have the option to take the Texas LTC class online or in person. If you would like to take it online click here: Take Class Online. The required shooting portion of the class is also on a very basic level and focuses mostly on safe gun handling. Newer shooters often pass with ease. We will cover the application process in the class so there is nothing you need to do before taking the class. The Texas license to carry also known as the Texas LTC is a 5 year license and you simply renew it online every 5 years, you no longer need a renewal class to renew your license. Once you take the initial Texas license to carry class to receive your license, you will never have to take another class. If you ever move out of Texas you can still keep your Texas license to carry active by simply renewing it online every 5 years from what ever State you live in. We have loner guns available. Bring 50 rounds of 9mm if using our guns.